Platinum Party Bus Limos is your limo bus rental for Kitchener and the surrounding areas. 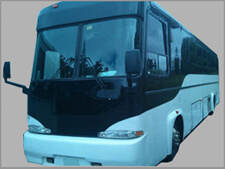 We provide you with a variety of limousine buses that you can rent for any special occasion. Our selection of party bus limos will not be surpassed by any other limo bus company in Kitchener and that is why we pride ourselves in knowing that when you are looking to reserve a party bus limo for your next special occasion, look to Platinum Party Bus Limos today. From our choices of party buses that seat 18 passengers, on through to 26 passengers, there is a party bus that has your name on it. If you are looking for something larger and more luxurious, we recommend that you go with a larger limo bus that can seat anywhere from 30 passengers to 50 passengers, and you will have the ultimate in luxury along the way. A party bus in Kitchener is great for such events as a wedding, a prom for your high school, a night out celebration and more. Some of the night out ideas that you can rent a party bus limo for includes, a bachelor night out, a Bachelorette night out, a milestone birthday and a special anniversary. So when you are ready to book a party bus, contact Platinum Party Bus Limos today to inquire about all the limo buses that we have available for you.